Juggling two jobs and a busy weekend hath made me mad. I am distracted, and though the bulk of what I do is done well, there are moments when, were you to watch me, you would think I might be in need of medication or, at the very least, a little light counselling. This afternoon I had a solemn duty. While my sister ran training for teachers, I was to collect Big Al, his sisters, and my son. I had it all planned. It should all have been so smooth. I have a porch. It it a little airlock between the Shrewsday way of life and the outside world, and it contains bicycles and smells of wellington boots. I stood in the porch, as distracted as Ophelia herself. I pulled the door shut with just four minutes to get in the car and drive to school down the road. And then it occurred to me that my keys were inside the house. Not only could I not get back into my house, nor – horrors – could I get into the car to teleport almost instantly to the school gate. No. I had four minutes to cover a walk of ten. And Big Al would be waiting. I berated myself (out loud) and cast about wildly for some solution. My eyes lit on Phil’s old bike. Phil’s bike has seen better days. It was actually my Dad’s, borrowed some time deep in the past. Phil gave up riding it a year or so ago; it has dodgy brakes, I believe, and other idiosyncrasies I have not bothered to fathom. Until now. There was only one thing for it. If I was to get anywhere in any sort of time, I must get on that contraption and cycle for my life. Picture, if you will, an overgrown stick insect trying to ride a bicycle. Add into the mix the stick insect’s inability to fathom the whole business of gears, and how they work. And that was me. I could not seem to get out of first gear, yet the bulk of the first two minutes was uphill. My knees seemed to be somewhere around ear height, and my legs were going like the clappers, a veritable blur. Yet the bicycle was only just creeping along. Extemporaneously, I tried every single knob, bell and switch on that frame, teetering between stasis and forward motion. And then something – to this moment I still am not sure quite what – clicked into play and I had a bit more power. Not much, mind, but enough to move forward a little painfully, legs whirring. And off I went. Slow and unsteady wins the race. This may not have been the opinion of the vehicles who subsequently became trapped behind me. Chicanes ahead meant overtaking was impossible, and there I was, a gangly flapping pied piper to a long row of exasperated cars and trucks. Finally, excruciatingly, I reached the top of the hill and the end of the chicane and the cars roared past, and I shot down the hill in great triumph. At last. some speed! Poop poop! I would get to that Reception class door yet. Until this moment, so thrilled was I to be moving, at last, that the queston of braking had not been an issue. Now, however, as I hurtled downhill at speed towards school, the issue became more pressing. And on application, I discovered I had virtually no brakes whatsoever. If I pulled with all my strength, I might effect a slight cessation in speed. I pulled and pulled and pulled and somehow slowed to the bottom of the hill, crossing the road and careering up the little footpath to school, drawing reproving glances from the school gate glitterati. But this stick insect got – a little shakily – off the boneshaker. And made it to Big Al’s door in one piece, and on time. Posted in Big Al, Shrewsday MansionsTagged bicycles, cycling, family, humor, humour, school runBookmark the permalink. Well done, that was worthy of a super-heroine! Thanks, Sidey. I must get a cape made. They are. I must remember to check them in a timely fashion next time, Jim. Quite. Though I’m not sure it was uppermost in my mind as I hurtled doen the hill, IE! You time the arrival of your blogs perfectly; so lovely to start the day with a smile, well today, it was a guffaw, and sometimes a deep thought of priest’s holes and the like. Marvellous – thank you! Thank you, Sue – I write the blogs in the evening and post them the next day early whenever I can. The writing gives me a huge amount of pleasure. There’s always something, isn’t there? And what about the aftermath? How did you manage to renegotiate the airlock without keys? Next post, perhaps, hmmm? Next post, Chris – it’s up now! I see it all, and am impressed. Most of all, I think, that you didn’t knock down any of the school gate glitterati. Surely you must have been tempted? Fiona, you know me too well. No. I ditched the bike and ignored the glares. Al likes his school collection to be prompt and stopping to swap insurance details might have taken a while. I think the latter conclusion is closest to the truth, Lou. The Munsters had their ‘normal’ one, and the Shrewsdays do too. Top piece of writing. I was with you on that bike, trying to go faster uphill to avoid the approbation and curses of the seething motorists, the relief of breasting the summit and the dreadful realisation of the lack of stopping power. Exhausted. A workout first thing in the morning without ever leaving your laptop, Roger. We do. The fates seem set on derailing us, Alison 😀 Thank you for coming along to read and comment! 😀 And mine. You are welcome, Brett. Hope you managed to negotiate you and your charges home without mishap . . . and in time for tea. I did, Nancy. Despite everything that happened, it all turned out right in the end. So glad you arrived safely! The mental image I’d conjured, while amusing, did not hold much promise of a happy ending. This experience had to take you back, Kate, to the days when you flew past Phil’s car on your bike on your way to work. 🙂 I am glad the brakes finally worked. Well, if there ever was an doubt that you’re the UK’s version of Wonder Woman, Kate, this post is that proof. Just having read it I need to pop a few Aleve and slather myself with icy hot balm. It was quite high energy, Lame. I did. It is sitting in my sister’s back garden, Billy-No-Mates, Tandy. Wow – that was a real Tour de France … er, I mean, de Force! Two rather important things on a bicycle are getting it to go, and getting it to stop. Much will be revealed by the answer to this: Was Al surprised to see you with a velocipede, or did he simply take it in his stride? Oh, Kate, forgive me please for laughing. I know what a terror of a ride that must have been, but, your words are so well written and so funny (such as “a gangly flapping pied piper to a long row of exasperated cars and trucks.” that I’m giggling here. Of course, the ending begs me to question how you got back home with Big Al, not to mention the princesses and Felix and a very locked up house. I’m glad you arrived safely. The no-brakes thing was scary. Hmmm. I’ve been looking at women’s bike ads lately, thinking of taking up riding again in my old age. I was a real whiz on the bike back when JFK was president. Why not start riding again, says I? No hills. Just the flat parts. Priceless Kate! Still laughing at the mental images this conjured up, particularly of you careening past the ‘school gate glitterati’ 😆 Al must have been so proud of his super-heroine aunt! Hysterical, Kate. A painful reminder of similar incidents in my life. One involving a borrowed bike with multiple gears which I did not know how to operate. It could have had serious consequences as I whizzed thru an intersection, unable to stop the bike. Fortunately, my good luck prevailed over my lack of common sense. I think I must borrow this bike, Kate. 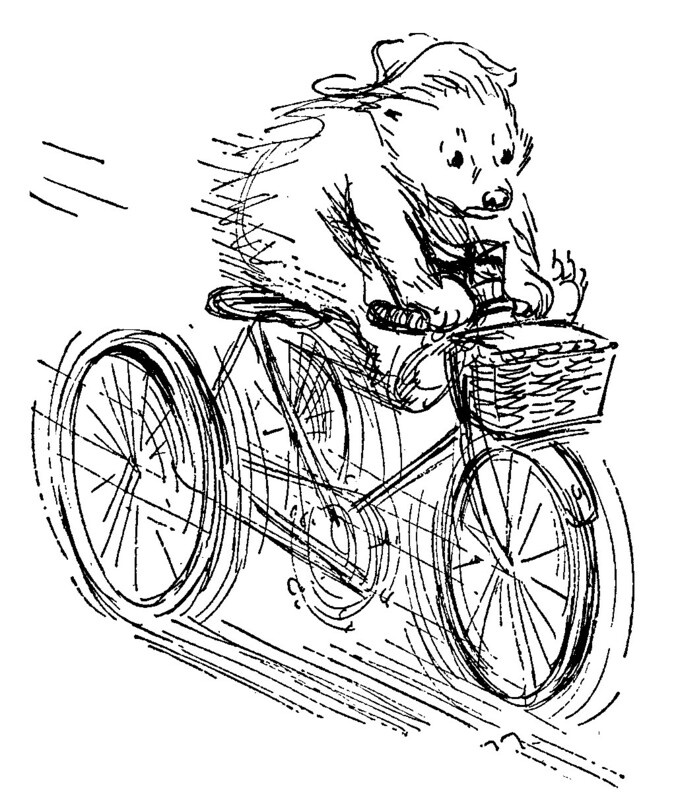 It seems I would make more sense upon it, than simply hurtling downhill without any brakes on no bike at all. Such is life, at the moment, I guess.